An ionic compound is composed of a positive ion called a cation bonded to a negative ion called an anion. The cation can either be a metal or the ammonium ion, while the anion is a non-metal. Generally, ionic bonds form to lower the potential energy between positive and negative ions. How does an Ionic Bond form? The number of electrons in the outer shell of an element is based on its group number. The sodium (Na) atom is in Group 1 and the chlorine (Cl) atom is in Group 7. Metals transfer their electron(s) to nonmetals based on differences in polarity and electronegativity properties. Transfering Electron(s)The transferring of electrons creates ions with opposite charges that are attracted to each other. Lattice energy represents the energy released when 1 mole of an ionic crystal is formed from its gaseous ions. The stronger the lattice energy of an ionic compound then the greater the strength of the ionic bond, the higher its boiling point and melting point. 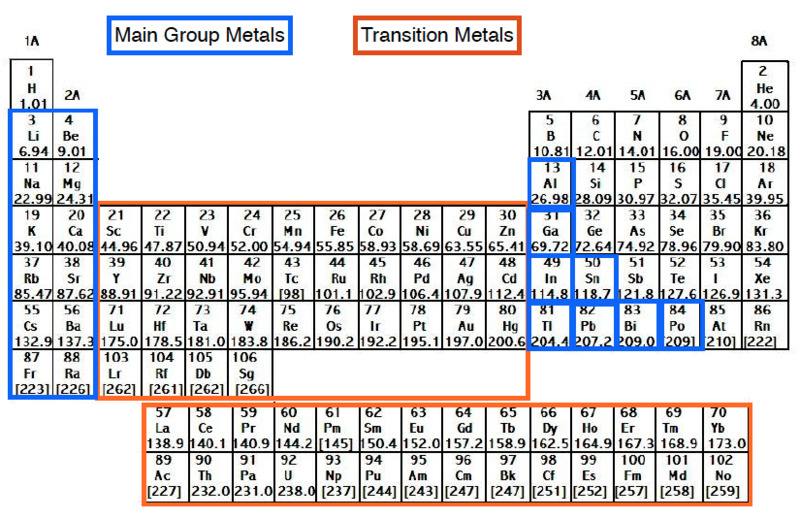 The Main Group Metals exclude the transition metal elements. When it comes to naming an ionic compound with a main group metal we can use a set of easy to follow rules. STEP 1: The metal is named and written first. For example, if we are given BaCl2 the name begins with barium. STEP 2: The nonmetal keeps its base name but has its suffix ending changed to –ide. Base Names of Non-MetalsFor BaCl2 the nonmetal is chlorine and after its ending is changed we have chloride. STEP 3: Combine the first and last name to get the overall name of the ionic compound. The name of BaCl2 is barium chloride. The Transition Metals and Inner Transition Metals, of which are further divided into Lanthanides and Actinides are sometimes referred to as the Group B Elements. The transition metals have varying oxidation numbers and therefore possess multiple charges. As a result of these different potential charges we must use Roman Numerals when naming ionic compounds with transition metals. STEP 1: Determine the positive charge of the transition metal. For example, if we are given MnBr5 we will determine the charge of manganese by using the charge of bromine and the overall compound. For MnBr5 we begin the name with manganese (V). Base Name of Non-Metals For MnBr5 the nonmetal is bromine and after its suffix ending is changed we have bromide. The name of MnBr5 is manganese (V) bromide. Recall that polyatomic ions represent compounds composed of multiple elements that possess an overall charge. STEP 1: The positive ion named and written first. If the positive ion is a transition metal with multiple charges then we use a roman numeral. If the positive ion is a polyatomic ion then it keeps its name. For example, if we are given NH4NO2 the name begins with ammonium. STEP 2: The negative ion is written and named secondly. In NH4NO2 the negative ion is nitrite. The name of NH4NO2 is ammonium nitrite. If we want to write the formula of an ionic compound from the name then we must work with the charges of the elements. STEP 1: Based on the name of the ionic compound give the two ions that are involved. .
For example, if we are given the name of aluminum oxide. Alumium is in Group 3 and has a +3 charge and oxygen is in Group 6 and has a -2 charge. STEP 2: When the charges of the two ions are different numbers then we crisscross them. When the charges of the two ions are the same number then they simply cancel out. Besides naming ionic compounds it’ll become important to know how to name covalent compounds/molecular compounds and acids. Unlike ionic compounds, covalent compounds have the sharing of electrons between non-metals. Calculate the number of moles for each compound in the following table.